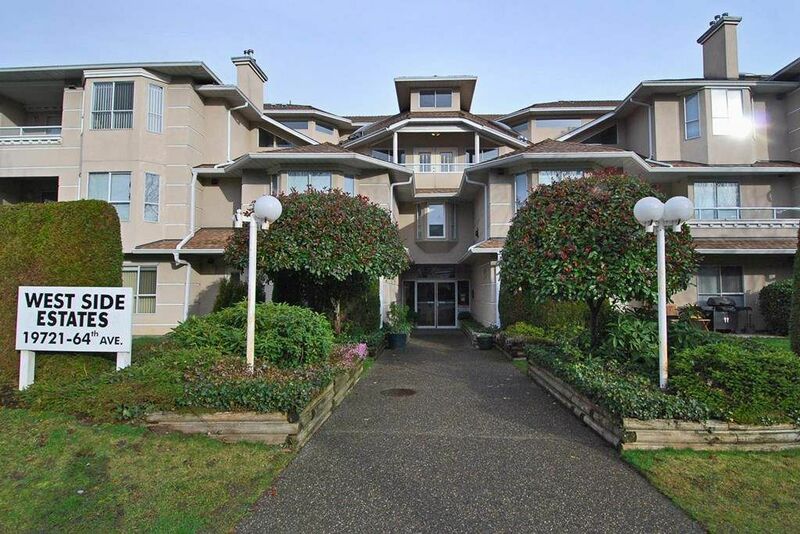 "WESTSIDE" SPACIOUS, QUIET, TOP FLOOR, CORNER UNIT, just four steps down to this approx 1055 sq ft, 2 bdrm, 2 bath condo located within a block of the Willowbrook Mall, transit and all amenities. Nicely UPDATED with fresh paint, kitchen cabinets painted white, laminate flooring, and NEW VINYL WINDOWS installed in 2017, light fixtures, new cabinets and countertops in bathrooms. VERY BRIGHT with extra windows. LARGE living room and dining room for entertaining with FRENCH DOORS to a COVERED patio. 2 parking stalls: 1 covered, 1 open. 1 storage locker located on the same floor as unit. Not wheelchair accessible. Pets allowed with restrictions, smoke free building, no rentals and no age restrictions.